"Learning a new language is like getting a new window in which to see the world"
"Learn a new language and get a new soul"
"A new language is a new life"
· I need to understand work emails in English/German and meetings at work. · People in my country come from all around the world and it's difficult to understand their accents. · I want to feel confident speaking in meetings. · I want to be able to teach my children English/German. · I want to be able to understand films in English/German. I will email and chat online with my colleagues both formally and informally about work. I will write my professional texts directly in English/German, every month. I will start to write my diary in English/German (my feelings, thinkings, experiences, opinions about some events that happened that day), every day a few sentences. I will write my FB posts in English/German, with or without the help of a dictionary. I will go out with my foreign colleagues every Wednesday when they go for a beer and get involved in the discussions. I will attend English/German meetings twice a month, I will ask my best friend to join me. I will read one English/German graded reader at Level 4-6 every month. I will follow a minimum of 3 FB pages about cooking and spend at least 30 min per week reading the posts/links. I'll memorize 5 English/German songs. I'll fully understand one English/German movie by watching it every day. I'll pass my English/German test. Do You Have a Dream or a Goal for Your English/German Learning? 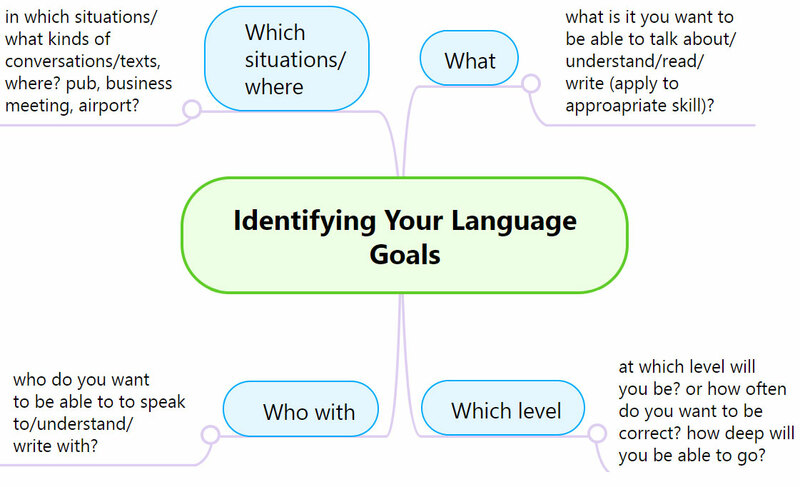 What are your short and long term English/German language learning goals?